Four years after the original "Happy Feet" won Best Animated Feature at the 2007 Academy Awards, we get "Happy Feet 2," a film that struggles to find its message as it wheels through a jukebox-worth of cover songs. Mumbles (voice by Elijah Wood) is all grown up these days, with a wife, Gloria (Pink) and kid, Erik (EG Daly, who voiced the young Mumbles in the original). 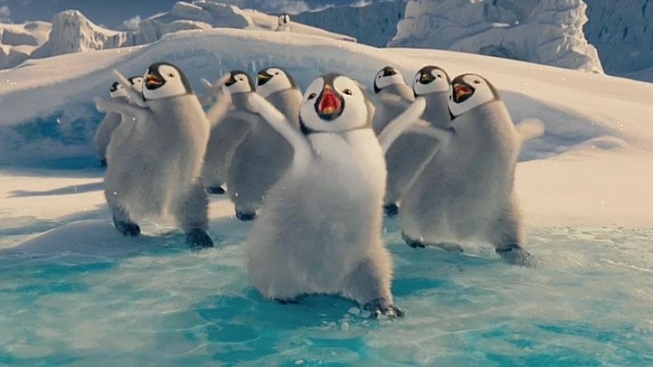 What hasn’t changed in the years since the first "Happy Feet," is the Emperor penguins' love of dance. Tragically, after much browbeating from his father, Erik proves himself to be, first, a reluctant dancer, and then a rather clumsy one. Upon realizing that he's now the laughingstock of the penguins, he runs off in a huff setting in motion a chain of events that leaves him, his two best friends and his father as the only ones who can save the rest of the Emperors from famine. The best part of the film—in terms of look, narrative and philosophy—is the subplot featuring the voice of Brad Pitt as Will the Krill, a tiny shrimp-like crustacean that breaks away from his massive swarm in hopes of being free, over the panicky protestations of his friend Bill the Krill, who declares "There's no such thing as free, Will!" Their story is filled with amusing wordplay, and stunning visuals that would've been right at home amidst the more esoteric moments' of Terrence Malick's "Tree of Life." And Will the Krill presents a clear, focused view of the value of individuality, something for which you can feel the rest of the film striving, but falling well short of. But let's be honest, you're average child doesn’t care a whit about such thumbsucking meditations. What they care most about is catchy tunes and cute animals dancing their hearts out, and "Happy Feet 2" delivers these in spades—pity the poor parent who thought they'd put "Numa Numa" behind them for good.